MyClient can send a range of backup reports to your staff, customers and resellers. MyClient's reports are simple, attractive, customisable and help draw your attention to any issues with backupsets you are monitoring. When experimenting with the settings described below, please be reassured that emails are only queued, and will not be sent unless processing the mail queue has been enabled from the System Maintenance page. Once you are happy with the branding for these reports, please clear out any existing unbranded emails from the mail queue by using the tools on the "Mail: Browse History" page before enabling mail queue processing. MyClient can send a daily, consolidated email report to your customers. This is one email per day, with a summary of all backupsets on the account, in a modern format with easy links through to the full backup report (which can optionally require a password to view). The basic interface template can be chosen on the System Settings page > System Behaviour > Customer Notifications tab. On the System Settings page > Text Templates page, you may customise the text templates used in these reports - including the header and footer messages. You can also override many of the text templates at the reseller level, from the Manage System Users page. The systemwide options are used if no custom version is available for the reseller. You may set a custom header image for emails destined for reseller customers, by enabling the option on the Reseller dialog from the Manage System Users page. You can preview the report, as it would be sent to a customer, by using the "preview" link on the right-hand side of a Customer Detail page. 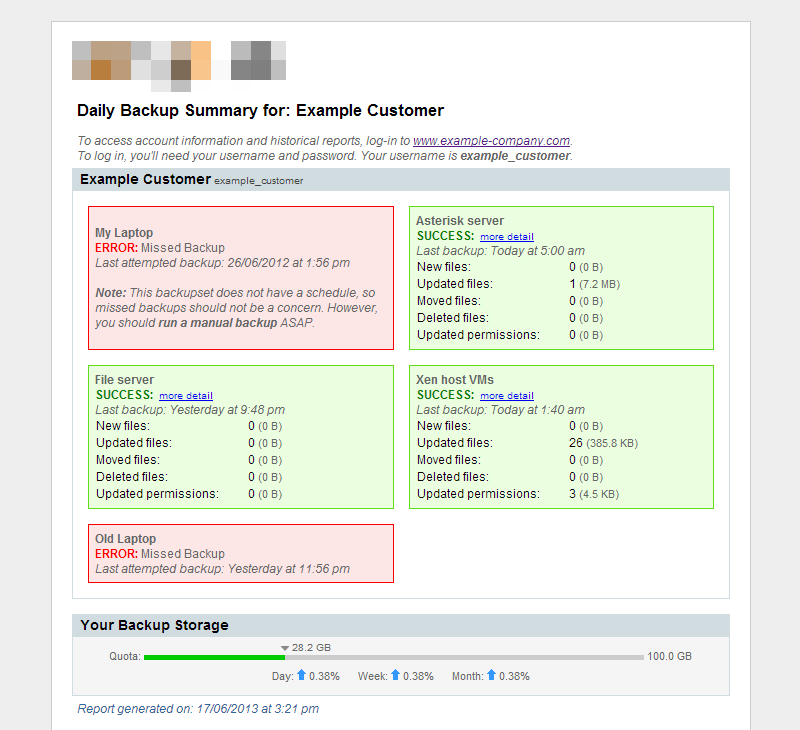 Daily Backup Reports can be enabled on a per-customer basis, on the People tab of a customer dialog. Reports can be sent daily, disabled, or sent only on failure. By default all customers have this option set to "System Default", which means the value is inherited from the option on the System Settings page > System Behaviour > Customer Notifications tab. It is also possible to prevent sending any daily backup reports at the reseller-level. This option is available on the System Settings page > System Behaviour > Permission Groups. If you are using MyClient Enterprise, it is possible to trigger sending a daily backup report at any time, or in response to any internal or external event, for any customer or range of customers, using the Manage Event Handlers page. MyClient synchronizes a customer's backup report recipients with AhsayOBS, so it is simple to switch from AhsayOBS reports to MyClient reports by disabling the relevant tasks on the Routine Job page on the AhsayOBS web console. However, although MyClient can enable or disable daily backup reports on per-customer basis, this is not possible with AhsayOBS other than remove the recipients; but since the recipients are synchronized, it is probably necessary to switch all customer reports at once. There are many more options to explore, particularly on the Customer Notifications tab on the Manage System Behaviour page - including which time reports are sent, which style of quota bar to use, and many more. Each MyClient system operator has the option to enable receiving the Watchlist and Event Log in an email format. An operator may configure these themselves from the Account link, at the top-right of any page; or a system administrator may enable or disable these reports for each user on the Manage System Users page. In summary, the Watchlist provides a self-curated list of backupsets that you are currently troubleshooting; the Event Log provides a highly focused list of only backupsets that are currently displaying errors, based on your own monitoring criteria. You may choose when Watchlist and Event Log emails are sent by using the options from the System Settings page > System Behaviour > System Users tab - as well as other options covering the specific behaviour of the Event Log email. You may select a recipient and a graphical template to use for the report. A number of graphical templates are available for use in any of the above reports. More templates are added over time, so we recommend looking through them using the Preview option in order to find one you like. Single-customer reports display only one quota block in a friendly manner: these templates are intended for Daily Backup Reports and any custom reports that target a single backup account. They display detailed information about the most recent job. Multi-customer reports display each customer's quota block inline with their information: these templates are more direct and less forgiving with the information they display, often including potentially harsh technical information such as the last time a backup completed successfully, and the number of failures since the last successful backup. These templates are intended for staff and resellers recieving the Watchlist and Event Log emails, and any custom reports that target multiple backup accounts.